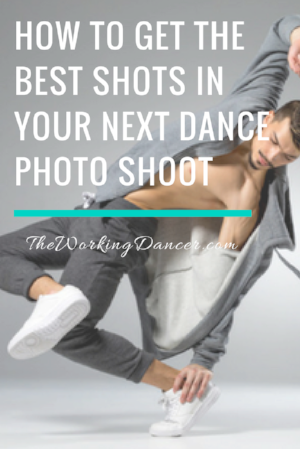 Long gone are the days when your head and body shots were the only photos you really needed for your dance career. These days, production teams are looking for far more than just submission materials. Now, they're looking at the quality of your social media profiles, and even your number of followers too. When a choreographer or casting director checks your social profile, what will they see? Will your description and posts clearly indicate that you're a professional dancer, or is your professional image lost under a pile of memes and puppy vids? The photographer is just as important to your shoot as you are. Be sure to "know before you go." Be familiar with who they are and what they can execute. The better relationship you're able to build with your photographer, the better your shots will be. "Explore a photographer's work before going into a shoot, suggests Andrew Eccles, award-winning photographer and longtime collaborator with Alvin Ailey American Dance Theater." Before you shoot, get a clear vision for your session by researching images that resonate with you. Share those ideas with your photographer, and use them as a source of inspiration when it's time to get in front of the camera. "Have a few poses that you think make you look good," says Quinn Wharton, photographer and former dancer. Instagram and Pinterest are great resources to search for inspiration." "Try to be as simple as possible," says dancer, choreographer, and photographer, Jacob Jonas. Let the movement and structure of your body be the focus." To brand yourself as a dancer, you'll need to get movement shots. With that, you'll need to prepare for the shoot by warming your body just as you would for class, rehearsal, or a show. "While the photographer should be mindful of the types of surfaces being used, it's your job to protect your body. It's perfectly acceptable to speak up for yourself in a shoot, especially if the photographer doesn't have much experience working with dancers." Again, treat your dance shoot just like any other dance endeavor. You'll need to prepare, but you'll also need to be present in the moment with an open mind. Just as with class or rehearsals, you may need to adjust your vision according to what's working. "Some movement may be exciting while dancing but doesn't translate to a two-dimensional photo," says Eccles. If your original ideas aren't working, use the photographer's direction to imagine new possibilities. Focus on what is working, and move forward with that." Just as you'll be using your new shots to brand your work, your photographer will likely want to use them to build their own portfolio as well. Be sure to communicate with the photographer about which images you're comfortable sharing. "What may be beautiful to the photographer is not always the best line or angle for a dancer," says [Paige Fraser, dancer with Visceral Dance Chicago.] Communicate with them before pictures are posted. Most photographers will respect that." Want first dibs on more amazing dance career insight like this? Then click the button below to join the movement, and you'll get weekly dance career tips, inspiration, freebies, specials, and more sent directly to your inbox.